Roy Spencer was born in 1918 in Stamford, Lincolnshire. He embarked on a career as an architect in 1938, but when the Second World War broke out in 1939 he was called to serve with the Army abroad. 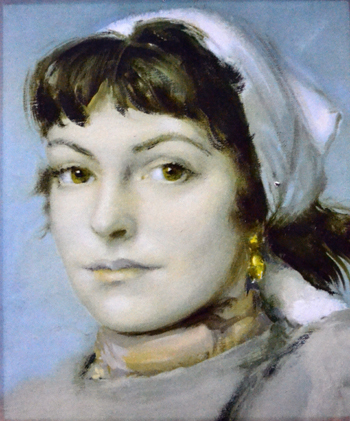 Like the Aero artists Anthony Devas and Norman Hepple, and the Aero Girl sitters Rose Wylie and Stephanie Tennant, he counted the leading portrait artist John Stanton Ward among his associates. From 1946 he studied at Chelsea School of Art under Raymond Coxon, and at the same time he taught at Wimbledon School of Art. After completing his studies he went on to teach at Chelsea School of Art, continuing to work as a tutor there into the 1980s. Spencer was well-known for his life drawing classes. He also worked as a commercial artist for House and Garden magazine, freelanced for Shell and was an illustrator for the Bodley Head publishing house. He had solo exhibitions at Trafford Gallery (1950), Bath Festival (1970) and Sally Hunter (1990), and his work was shown at the Royal Academy and the New English Art Club. Spencer was teaching at Chelsea College of Art in 1955 when he was commissioned to paint a portrait for the Aero Girls 'DIFFERENT' campaign. He chose to paint Rosina Bacharach n&eacute;e Grispo, who was a young 19 year old art student studying at Chelsea at that time. Little is known about how Spencer was selected to be an Aero artist, though it is likely that he was connected to the Aero advertising agency JWT through the Chelsea art scene of the time, and would also have been well-known as a commercial artist and illustrator by then.